We first met YappGuru at the national ASHA convention two years ago. After speaking with YappGuru's CEO, Mai Ling Chan, MS, CCC-SLP, her passion for speech therapy and mobile apps was obvious. Naturally, our team was thrilled to see her again in Orlando last fall. In addition to growing the platform, Mai and her team encourage other SLPs to vote, rate, review, and discuss speech therapy apps that advance the care SLPs provide for their patients. Her team also shares their knowledge with other SLPs on social media (see #SLPeeps) and at conventions. We were thrilled to be included as a featured developer for YappGuru. You can read our interview on our apps, our founding, our products, and other fun things here. 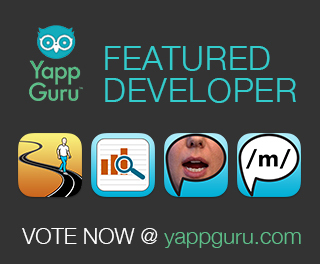 In addition to our blog post, you can review and rate our therapy apps in YappGuru's system. Not only are your reviews helpful, but also they help us advance our apps to better serve SLPs and clients. In fact, many times we hear from SLPs about a tiny modification that would help efficiency or production or assist a client, and we incorporate it into the next app update. We'll reiterate something we told Mai, "As a dedicated partner to clinicians and individuals with language and cognitive disorders, we are committed to finding the most effective and clinically relevant offerings for you." It's true. We know your heart is in the game, ours is too. So, what are you waiting for? Go vote for Lingraphica's apps now! We can't wait to read your reviews.